I finished this piece a few days ago, so I took some photos and thought I would share! 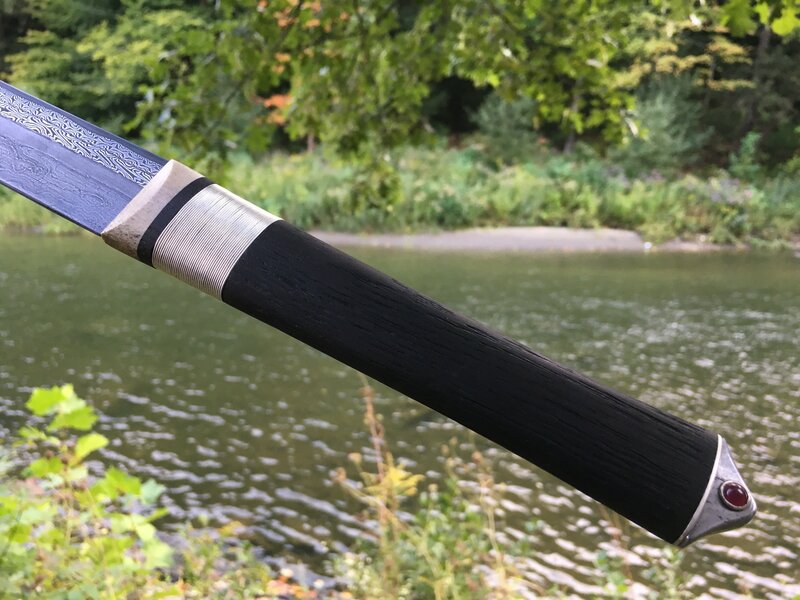 This began as a small billet for a demo at NESM for their annual hammer in, and upon finishing the blade a client signed onto the project, so I designed the hilt and we went from there! 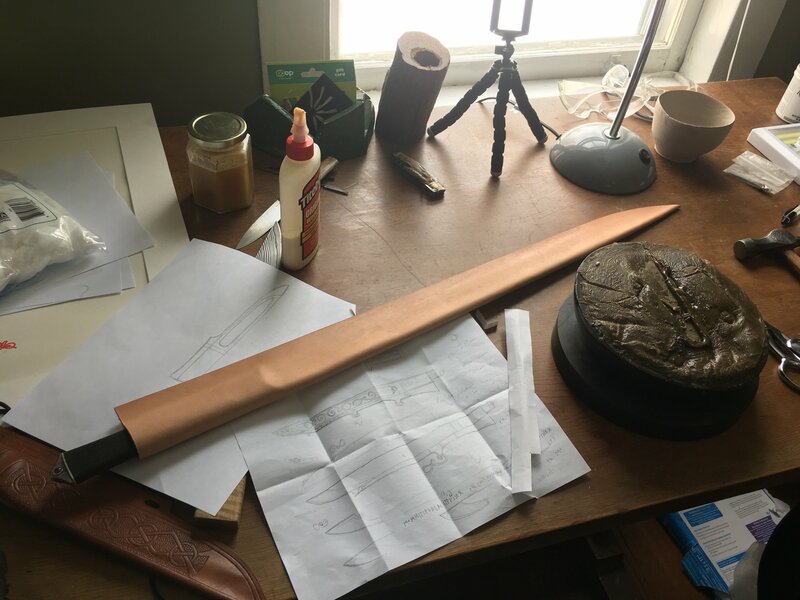 I still have to make the sheath, and when it's done I'll update this thread. 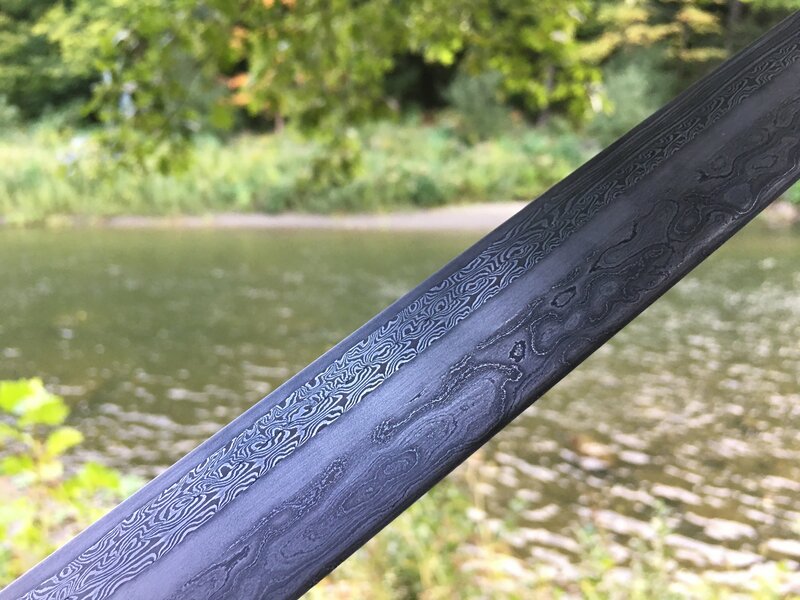 The blade is seven bars of pattern weld, wrought iron on the spine, four twisted bars, more wrought iron, and then an edge of ~400 layers. 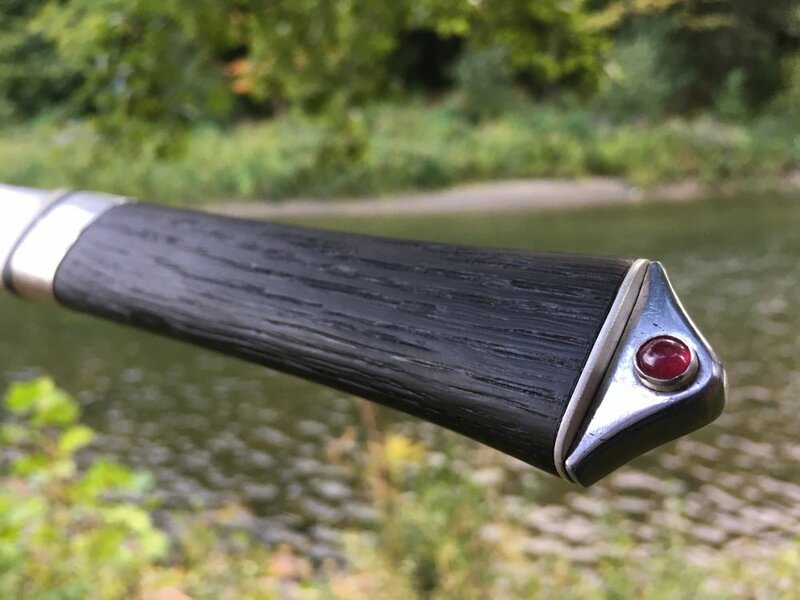 The handle is moose antler, bog oak, silver, wrought iron, and rubies. I guess I'll do the usual and post a few finished photos and then a WIP! 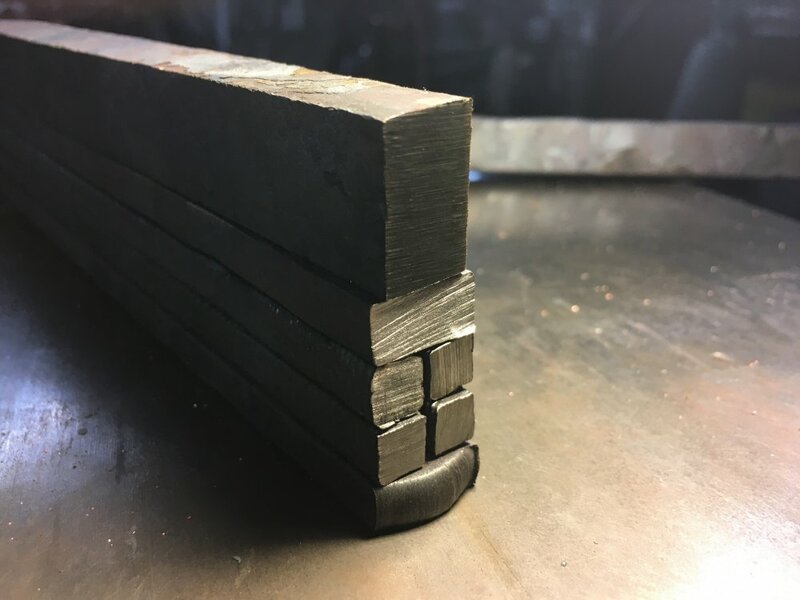 So this piece started off as a billet about 8 inches long. 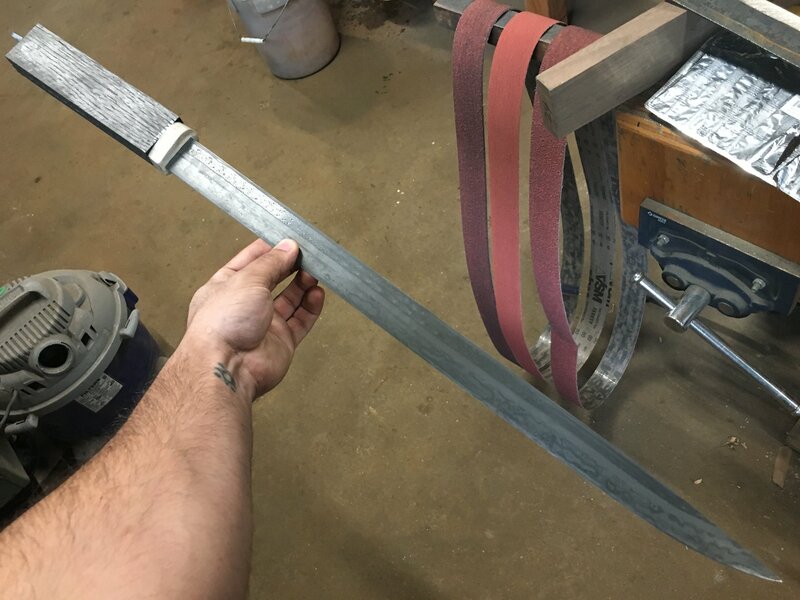 I twisted everything extremely tight and laid up the wrought iron and edge bar. 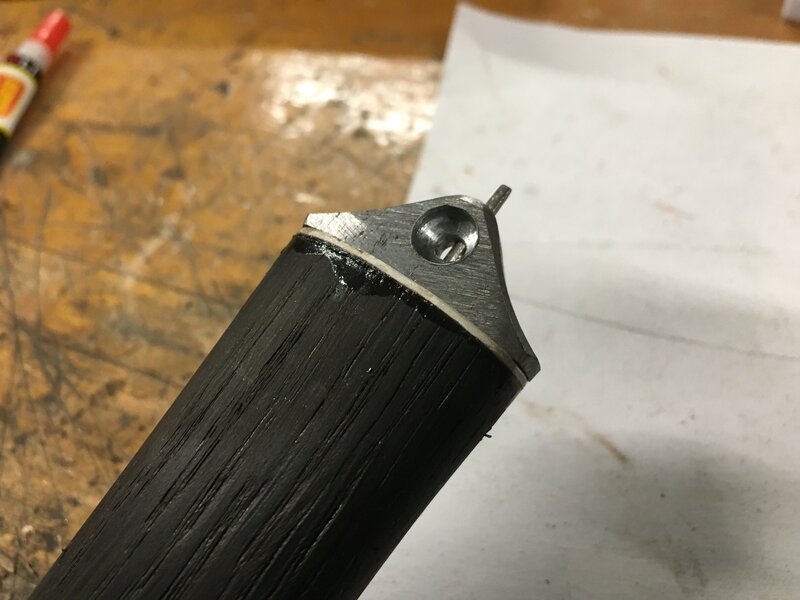 I tacked the billet on one end and brought it to Maine with me. 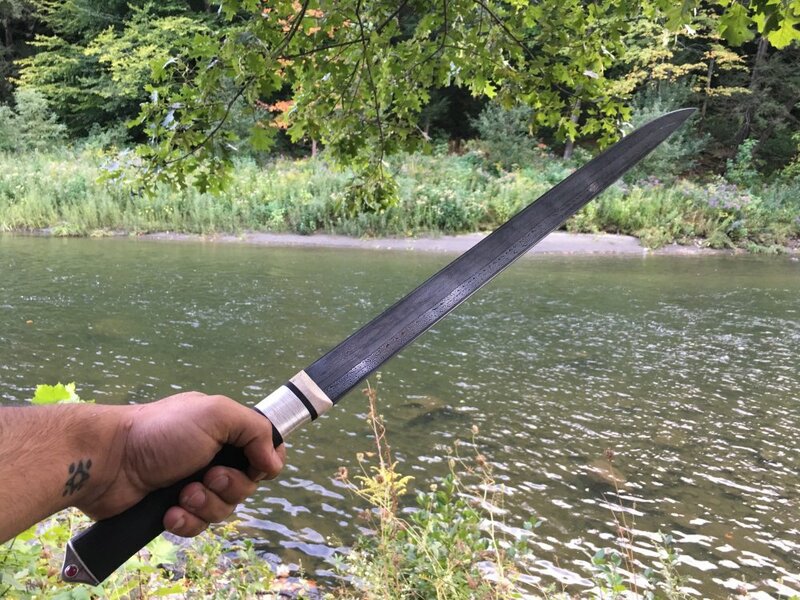 I was invited to demonstrate on both days, and first gave a lecture on the historical seax and then did a practical demo the next day, forging a long seax. 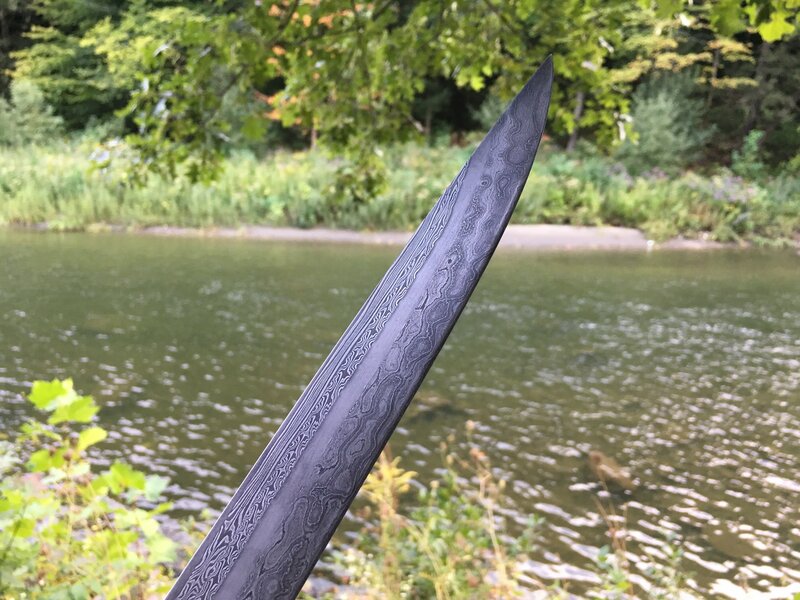 I then brought the blade to Zack Jonas' workshop a while after it was finished and began to work out what the design should be. Drawing from a few different artifacts I designed something that intrigued me. I used a few drill bits and a set of needle rasps to get the bolster fit properly. 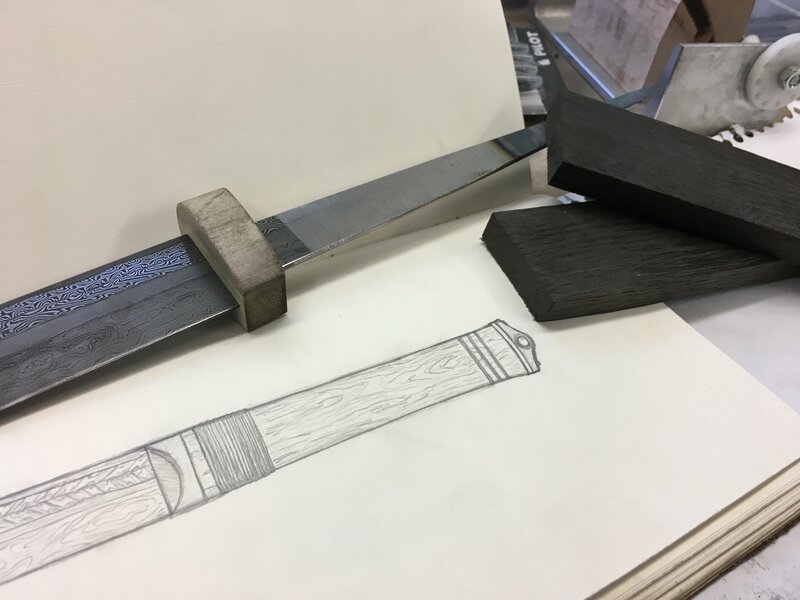 Here you can see the fit bolster next to the sawn bog oak and the drawing I made for the client. 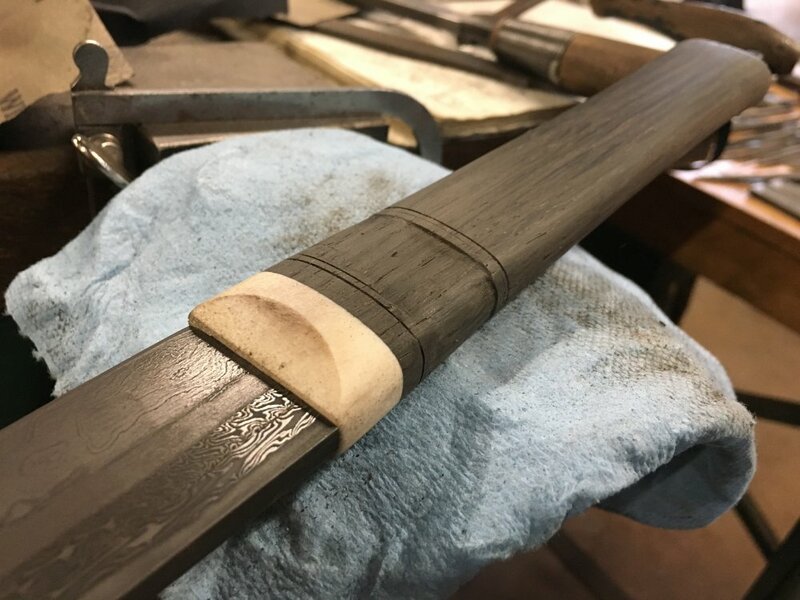 I used the needle rasps to file and clean up the slot for the tang to seat in the wood properly which is a new trick, I promptly went and bought my own set after! 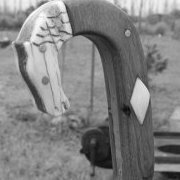 That's as far as I got at Zack's, and upon returning home I began to shape the handle. 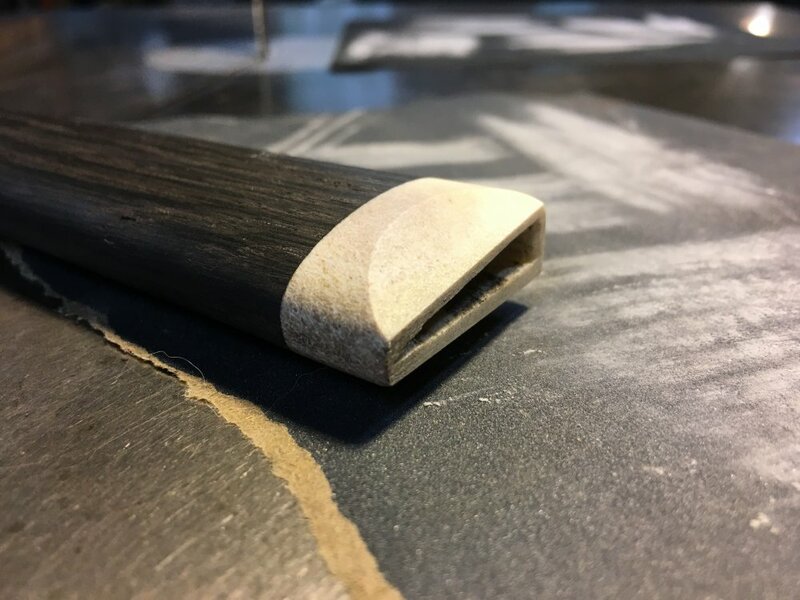 I always do my rough shaping on the belt grinder to establish the lines I am after and then use files or sandpaper to refine the shape. In this case I am going for a slight hourglass shape and need to do some careful firework to establish my lines. After about an hour the work is done and I can polish to about 400 grit in preparation for the rest of the detailing. At this point I figured I would set the half moon shape on the bolster as per my design. I did this freehand on the grinder and then polished with some paper on a flat surface. 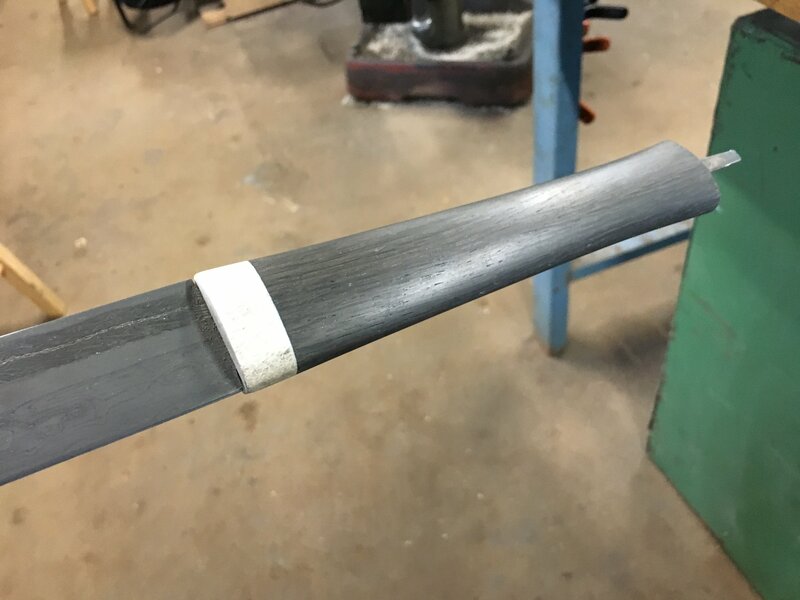 Here you can see there is a slight inletting in the edge side of the bolster to allow the blade to sit better. I used a jewelers saw to begin the cuts for the silver wire and then a series of files and rasps to make the recess for the wire. After some epoxy and a few wracked nerves the silver is in place. I couldn't remember what size bezel wire I had used in the past on the amber seax, but I did some experimenting and figured it out. Here's the piece next to the scaled up drawing I made to keep with me as I was working. I think I'll start doing this more in the future. 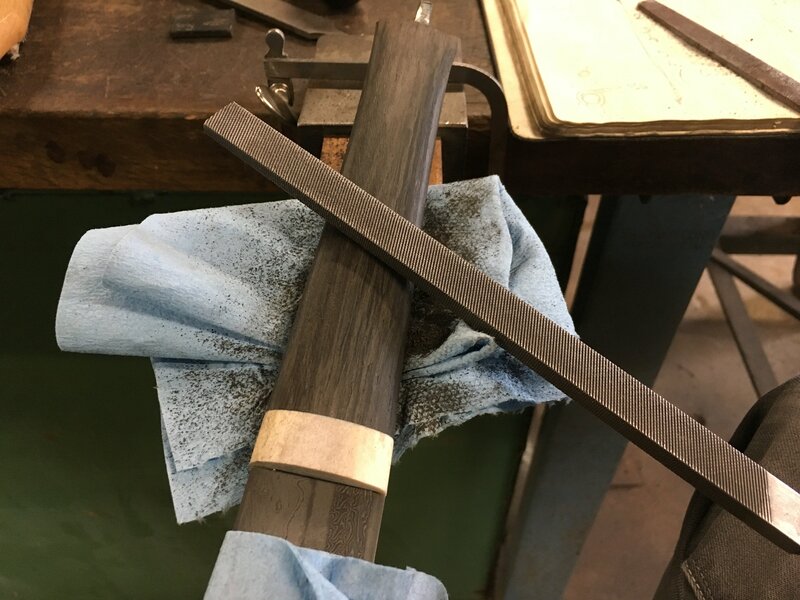 I cut out the piece of fine silver and annealed it, then bent it to shape on the back end of the bog oak grip, and because it was so soft it readily accepted its new shape. 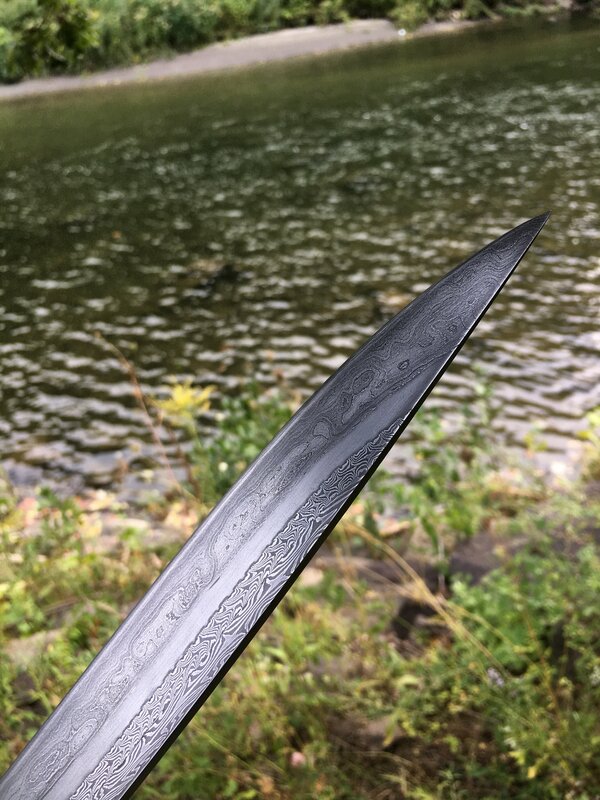 I took some nice wrought iron I had and cut a small coupon off and drilled and filed a hole to fit it to the tang. 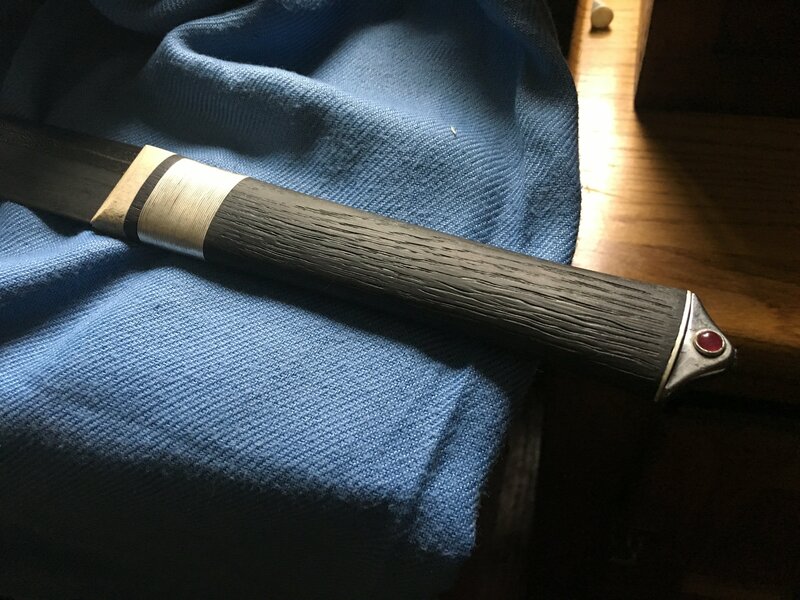 My original thought was to make the pommel just a cap and not be held on by the tang, but Peter convinced me I should weld an extension to the tang and peen the pommel on. Here I am using sharpie to get a vague idea of where I should grind to. I never really do this sort of work with a caliper and exact measurements, instead using my eye to get things close. I may change this some day and do more exact work, but for the style of work I do I feel that this gives my work a more 'organic' nature. I roughed in the shape on the grinder and then drilled my holes. I probably would change the order of operations next time. Once the pommel was roughly fit I began to tune the shape with files. Eventually I ended up with this. I began to peen the bezels in place from the inside to hold them properly. I did all of the setting work before attaching to the handle so I could burnish all the way around easily. 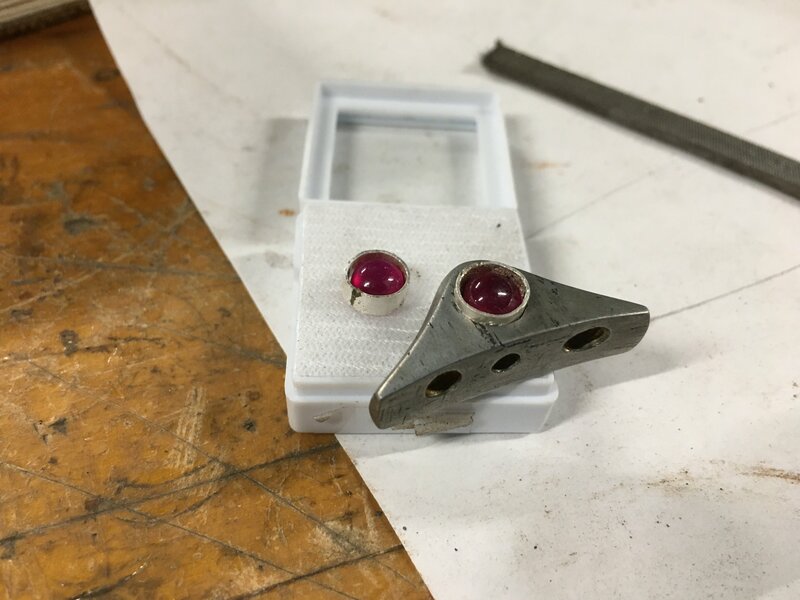 Once the rubies were set I peened the whole thing together after administering some epoxy. Here you can see the peen isn't cleaned up yet. 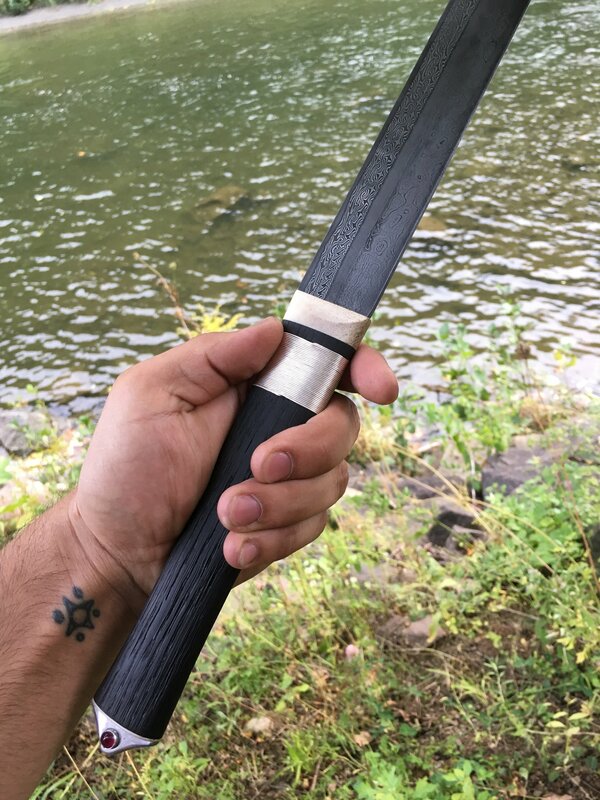 After some careful belt grinding and 2000 grit paper to clean the peen up, I went out back behind the shop to take some photos! I hope that's helpful or at least informative, thanks for looking guys! Dang! That sure is pertty. Excellent work. Another piece of work fit for nobility! A quick question about that peen block. There are three holes in the bottom. The center one is obviously for the tang end, what do the other two do? At first I thought there two alignment pins, but the holes seem pretty big for an alignment pin. So, I'm guessing weight reduction or epoxy space. sweet man! The overall grip shape is so elegant. 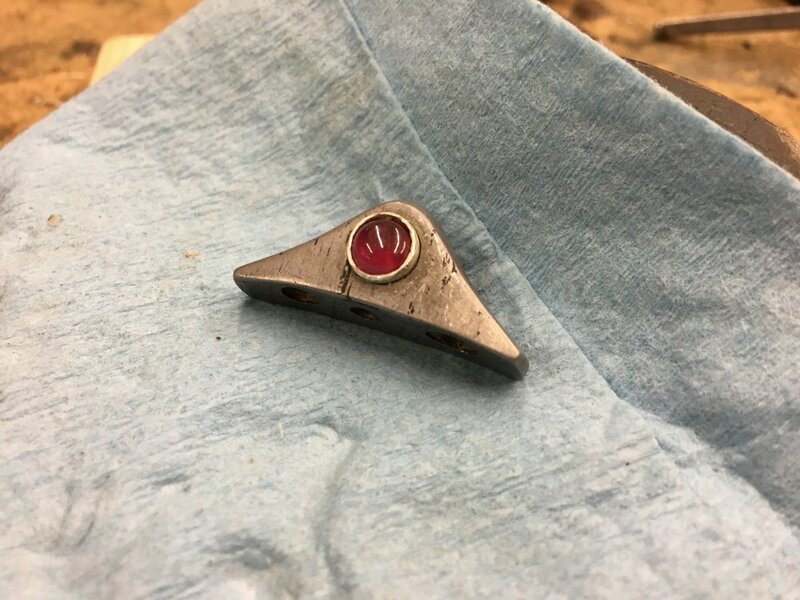 What keeps the rubies/bezels affixed to the pommel? Outstanding work. 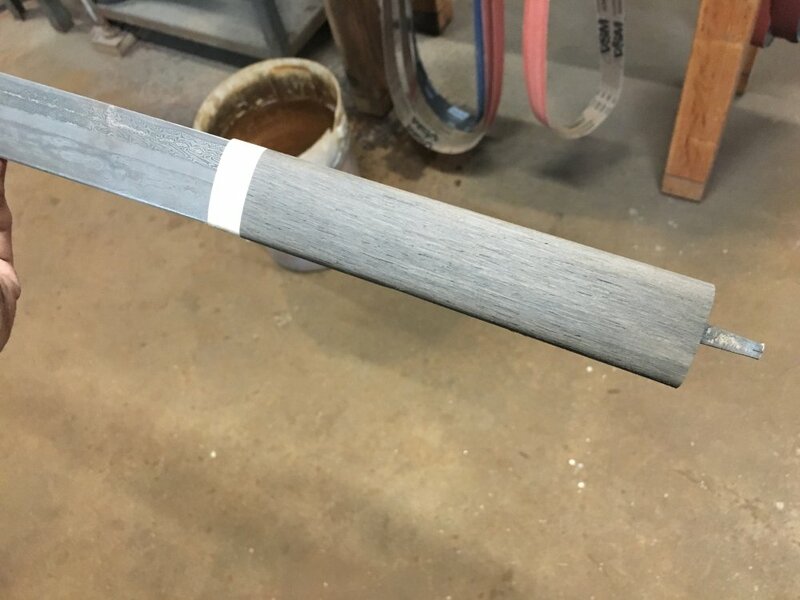 Bog oak is one of my favorites and the other materials accent it nicely. Thanks so much Joshua! 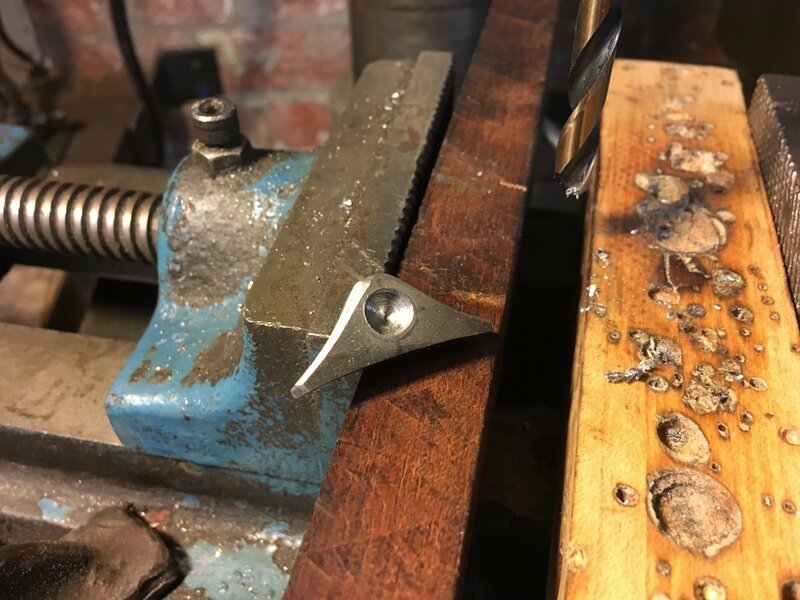 I actually secured the fine silver spacer onto the bog oak grip with escutcheon pins, the holes in the peen block are meant to allow the block to sit properly in place despite the heads of the escutcheon pins holding the silver on beneath! Thanks Alan, and thank you for the pin! Thanks Luke! I actually inserted the bezels and then went in with a sharp punch and peened the silver and wrought iron together at the bottom. 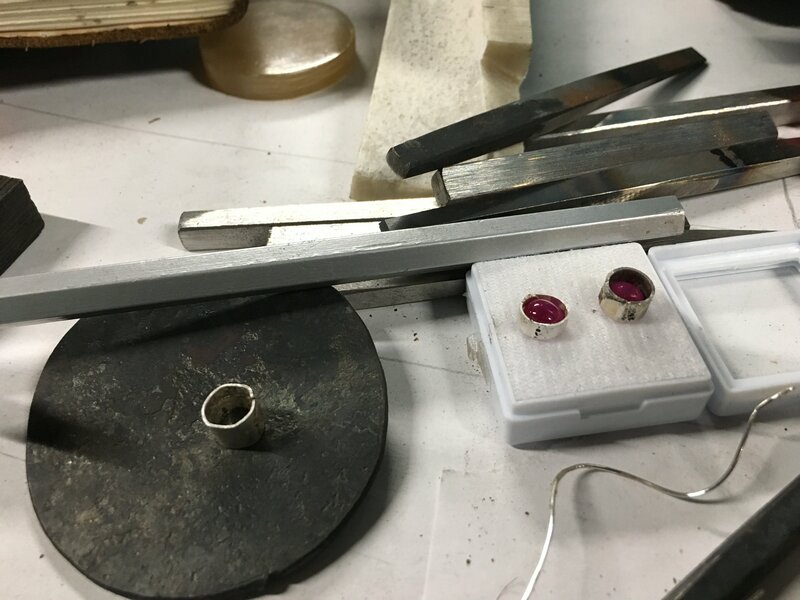 After that I laid the rubies in there and burnished them closed like usual! Imagine it like staking a guard to tighten up the fit. Thanks! It is really a dream to work with, it polishes well and takes beautiful texture, can't beat that! I am very happy with how the silver and moose antler accent it! There probably is no better combo than bog oak and silver. 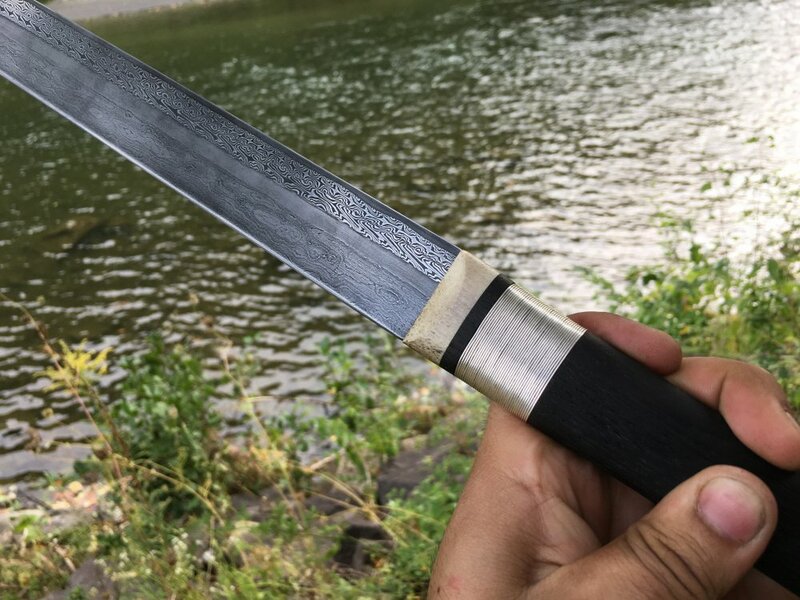 I also really love that little pommel, I might steal that idea for my next seax. I'd say you have outdone yourself my friend, but in all sincereness I know you haven't. That steel is amazing and the furniture no less so. I really hope I get to see some of your work one day in person. Now that, is really good thinking. This is a really, really nice piece. The PW is awesome. I'll bet the edge layer has some nice chatoyance. I like this a lot. Thanks for sharing it. The steel is incredible, those twists are perfectly sized for the proportions and space. I love how there is a pseudo square-wave sort of tooth thing near the tip. 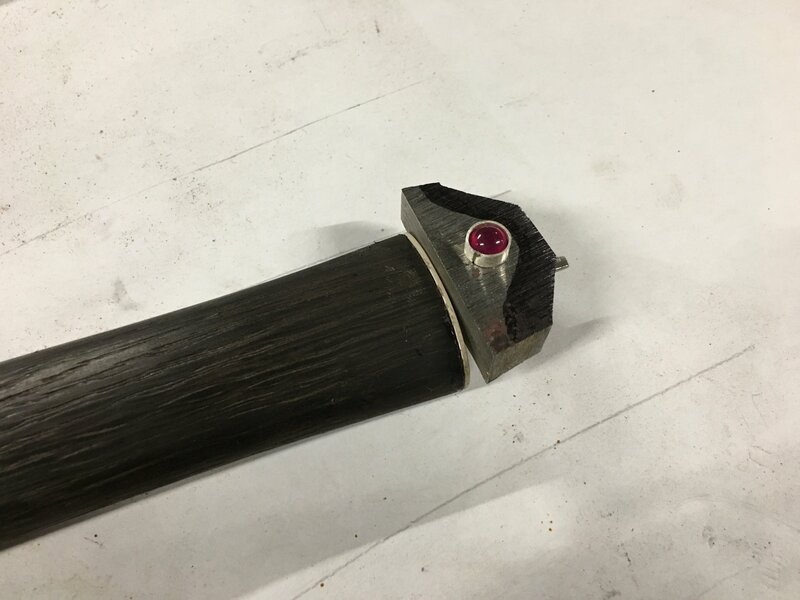 Also the evenness of the bands of wrought is surprising with how much length you got out of the billet but without the none-too-sneaky mark of hydraulics. Nice touch with the stones, too, just the right amount of regality that doesn't uproot its humbleness. Cheers from the sandbox and thanks for sharing! 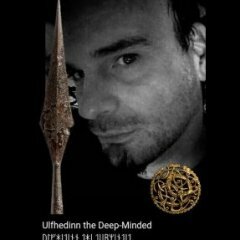 Interests:Finding the riddles of steel, Ancient Ancestors ways, Hiking off trail exploring the forests since I was a kid, Caving, Norse viking age Scandinavian culture, Edda's, Picts, Archeology, Paleontology, Metallurgy, History, DNA, Guitar, Philosophy, Meeting good cool people, Learning, Metal smithing, swords, seaxs, axes. 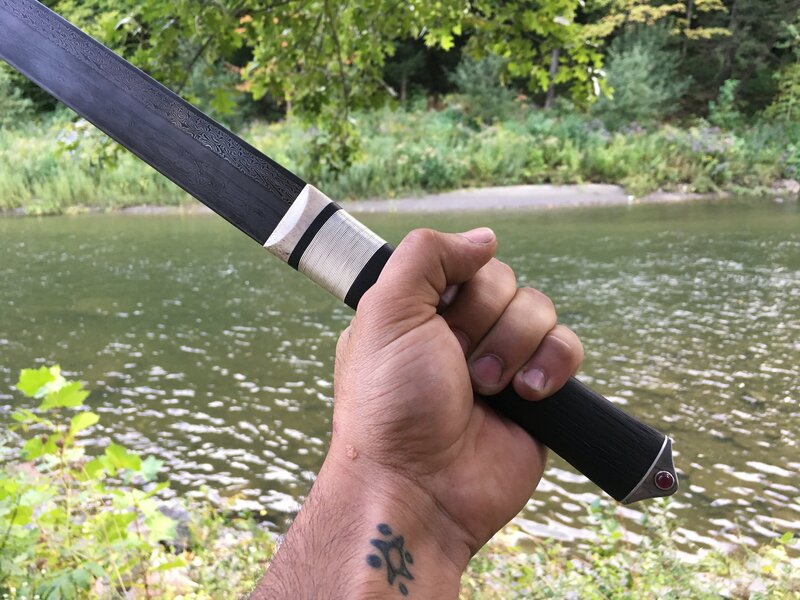 Exquisitely and artistically done and you are a true master of the seax, nice!! How do you the silver wire wrap, like the last of the wire? Absolutely amazing craftsmanship throughout, even to the tiniest detail. That is beautiful my friend, congratulations on another stunning piece. 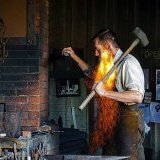 Beatiful job !!! tanks for sharing !! Thank you for the kind words Wes Next time you gotta come out to Blade show in Atlanta! 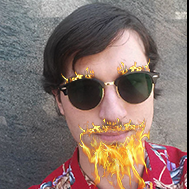 Or maybe I can convince you to come out this way for Fire and Brimstone or the like We'll figure something out! Every once in a while I get something good! Thank you Dave! The edge bar is certainly one of my favorite parts of this, actually forged by a good friend of mine as I was running out of time to prep the billet and had no PW on hand! It has been left dark for now but it has an evil sort of look to it, which goes very well with the bog oak! Thank you so much! I'm no where near a master yet, but the journey has just begun! I actually tucked the silver back in on itself. After the last bit of the silver was wrapped I took a pair of pliers, bent the silver inwards a little and basically stuck it under the rest of the wrap where it would be very tight! Thanks so much! I hope the rest of this project will live up to that! Gracias! Me alegra que te ha gustado! The first step is just starting! I have to admit at this point in the game I very much wish I was at the onset of this project! There are sometimes effortless works, and sometimes projects that stretch what you think you are capable of, and sometimes those growths are not without pain. Thank you! 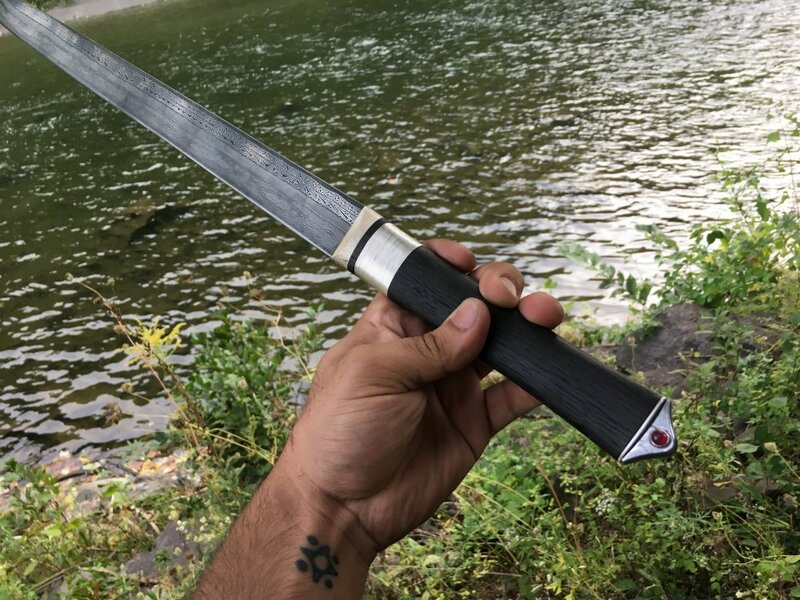 I have been following the work you both are up to down south, post photos of that wakizashi! 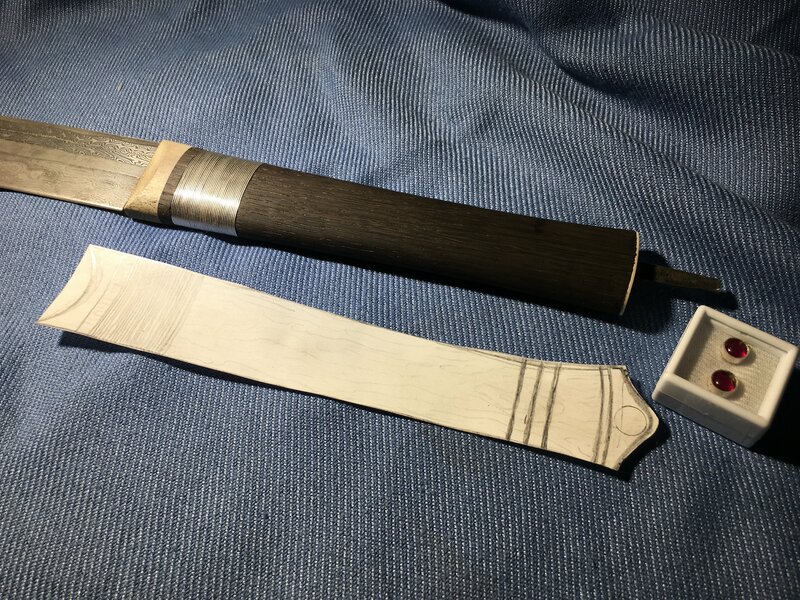 So this is a sort of WIP now that I am working on the sheath in earnest. Next was finding the elements I needed for the sheath. 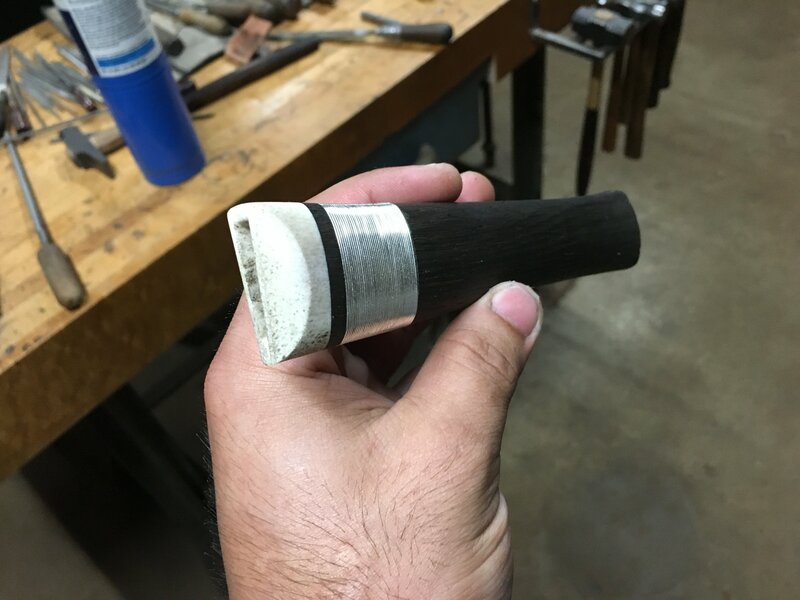 Following the moonlight theme we had established so far, the client and I decided to go with silver fittings for the sheath. I then set about finding the correct pieces. I found a 'waffle pattern' piece of silver which was the perfect thing. 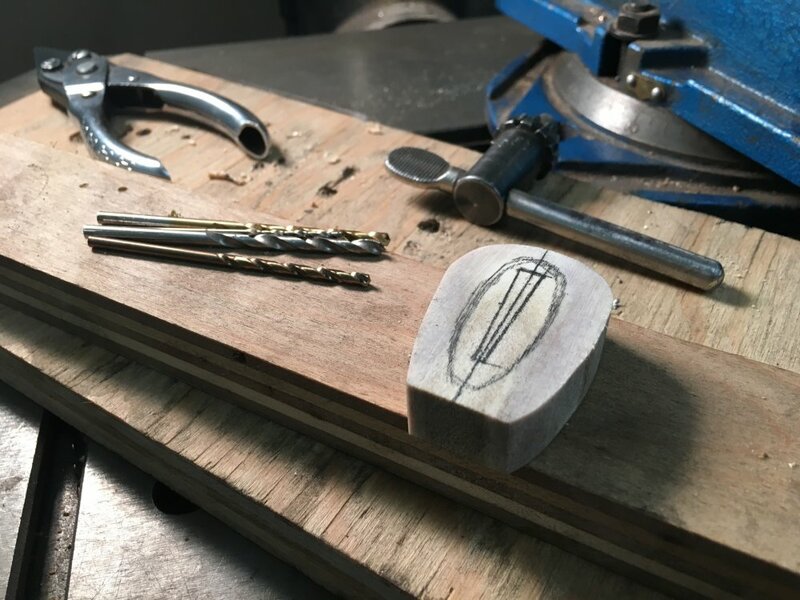 I am basing most of the work for this sheath off of Gotlandic style pieces so I had to create the little U shaped pieces somehow, and when close to 50 of them are involved, I decided my time would be best spent doing something other than chiseling them one by one. I bought 18 inches of the stuff, and though expensive it is far cheaper than me spending the time to chisel each and every line in. So I began with my trusty jewelers saw and began to cut all 50 of these pieces loose. The belt grinder wasn't wired yet and so I had to do all of the clean up by hand with some sand paper, which was odious work. Thankfully though it looks great! These little things worked out better than I could have hoped. 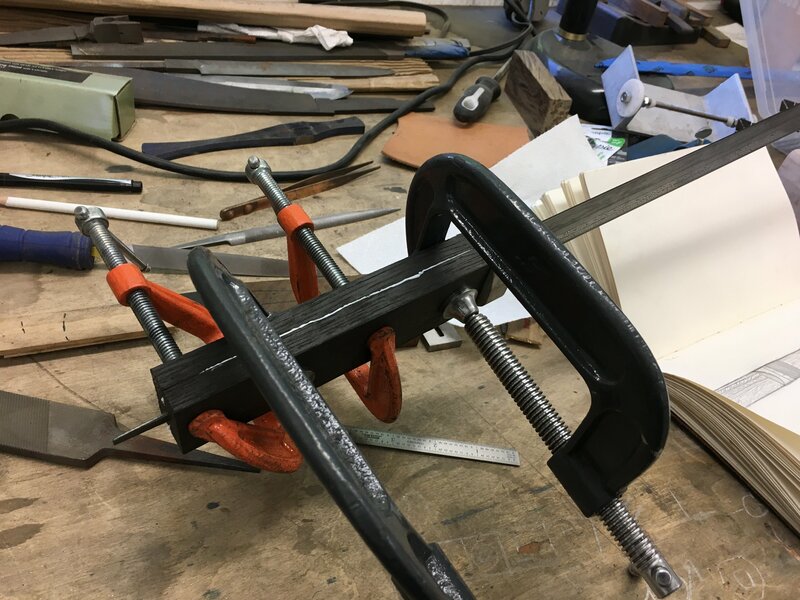 I bent each one carefully around a round file that happened to be the right diameter for the thickness of my leather. So now that my gamble with the silver patterned sheet had paid off, it was time to begin the tooling! I took inspiration form the Bamburg Casket and adapted some of the design work seen on the casket for leather. Once I had a rough sketch I sent it to the client for approval and we were off to the races! I started the leather work the way I generally do, which is with the frame for the work to fall into, and then with a light tracing of all of the details. I used the drawing which was 1:1 to trace the lines onto the leather. Here you can see I've actually begun to do some of the detail work near the bottom. And here are the tools I used for the whole thing. A small metal burnishing tool and a dot punch. I do all of my tooling with that burnishing tool, having taught myself how to do the work with it. I'm sure there are better tools for that sort of work, but why fix something unbroken? Little by little the work progressed. I began to measure my progress in terms of episodes of Frasier watched. This is something like 6 episodes in. And this is where I'll leave it for now! 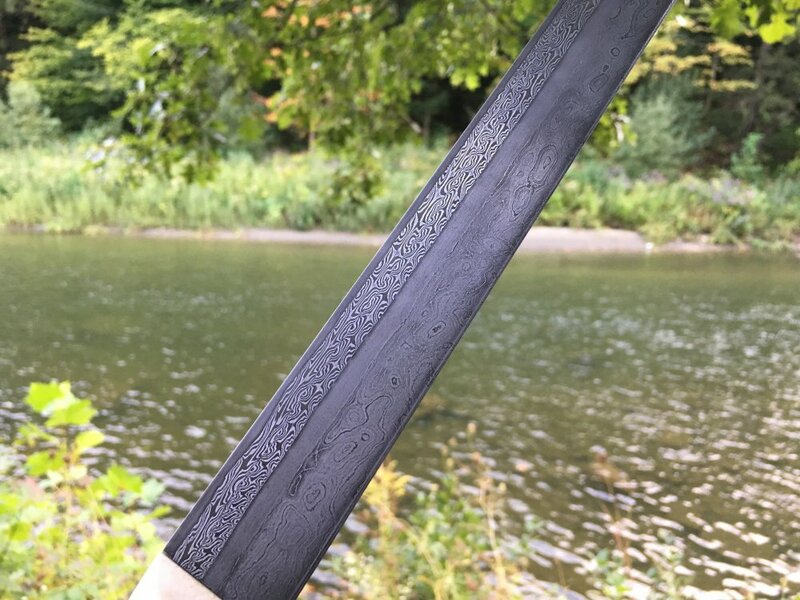 This week I will finish the tooling, including the section where the grip goes, dye the leather, and begin to fit the silver pieces into place permanently. Wow that sheath is looking great already! I didn't know wood glue worked with leather, it might just be an improvement over the super messy contact glue I currently use.